So a bug in WinSCP just took my site down for 30 minutes. The way it sometimes scrolls around right as you click is similar to what Win7 file explorer does. I don't know how WinSCP works internally, but if it's using some Windows widget, that's where the behavior might come from. I don't write many visual applications in Windows but I can imagine such a thing happening. Anyway, be careful when you click, in Windows 7 at least. Re: So a bug in WinSCP just took my site down for 30 minutes. Thanks for your report. Will try to reproduce it. My apologies for resurrecting an old thread, but I'm able to reproduce this on-demand using Commander interface in 5.7.7 (Build 6257) running under Windows 10. 1. Open a directory on the remote server. 2. Transfer a file from your local PC to the remote server using drag+drop. 3. 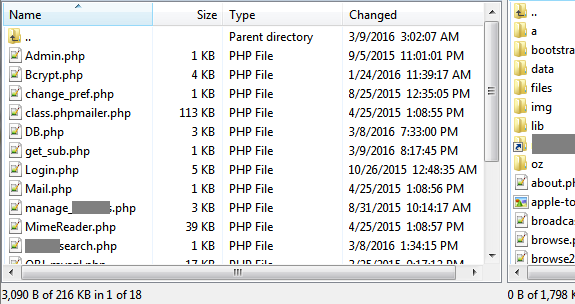 Scroll down in the remote server directory listing so you're viewing files below the first "page", then single left-click on any of the files shown. The directory listing jumps back to the top and your left-click is executed on whatever file ends up under your mouse cursor after the jump. Let me know if you need any other info to help track this down.